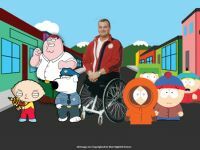 Motivational speaker Matt Glowacki will present a free program, “Diversity According to Family Guy and South Park,” at 6:30 p.m. Monday, Oct. 24, in the B&O Building auditorium on the Wheeling campus of West Virginia Northern Community College. The program, open to the public, is part of WVNCC’s commemoration of Disabilities Awareness Month. Stewie and Brian from “Family Guy” and Stan, Kyle and Cartman from “South Park” all have learned about diversity during episodes in their animated worlds. This month they will be part of the commemoration of Disabilities Awareness Month at West Virginia Northern Community College. Matt Glowacki, a motivational speaker born with no legs, will present a program titled “Diversity According to Family Guy and South Park” beginning at 6:30 p.m. Monday, Oct. 24, in the B&O Building auditorium, 1704 Market St., downtown Wheeling campus. The appearance is free and open to the public, made possible by a grant from the Diversity for Equity program administered by the West Virginia Higher Education Policy Commission. Coordinating the Disabilities Awareness activities at Northern is Denise Wycherley, student disability coordinator. She said Glowacki was born in 1973 in Janesville, Wisc., and his birth drew attention because even though he was healthy, he was born without legs. From the very beginning, his parents made sure to provide him with every opportunity to participate in a normal life. At age three, Matt became involved in community activities and went on to graduate from Craig High School. In his senior year, Matt earned the rank of Eagle Scout, served as the governor of the State of Wisconsin’s Key Club District, and managed his own business. He continued his education and community involvement at the University of Wisconsin at Whitewater, graduating with a bachelor of arts in communication degree with an emphasis in public relations and a minor in U.S. history. While attending the university and playing wheelchair basketball, Matt developed and administered a community awareness program entitled, “What It Takes: Cornerstones for Success.” Matt brought this program and his messages and competitive wheelchair sports to more than 25,000 students across the state. Matt currently focuses his life in two primary areas. The first is the world of business and community. He was employed for three years as an outside sales account executive for Lucent Technologies. During his tenure at Lucent, Matt was awarded the regional, “Master Sales Award,” and the “Giving Back to the Community Award.” In October of 1999, he left to focus on three of his own businesses, MOGO Wheelchairs, a very successful wheelchair building and sales business; Glow Music, a mobile disc jockey and entertainment service, and Myriad Communications, his speaking and consulting company. He resides in Sun Prairie, Wisc., and is active in many local organizations such as the Kiwanis and volunteers at different events. Matt served on the state Easter Seals board of directors. He was chosen by the governor of the state of Wisconsin to serve on the Governor’s Rehabilitation Council, which monitors and oversees the Department of Vocational Rehabilitation. The second focus of his life is competitive sports. Matt earned his position on the USA Paralympic Team for Sit-Volleyball in June of 1998, after he participated in the World Championships in Washington, D.C. He traveled and competed internationally with the team and attended the 2000 Paralympics in Sydney, Australia, and the 2002 World Championships in Cairo, Egypt. Matt served as the alternate for the Paralympics in Athens in 2004. He also enjoys traveling and playing on a wheelchair basketball team out of St. Louis, Miss. In addition, Wycherley said, the college will hold American Sign Language Deaf Movie Night beginning at 5:30 p.m. on Wednesday, Oct. 12, in the B&O Building auditorium. A DVD film will be shown in American Sign Language and the hearing audience will watch with closed captioning, she said.